Applicable for road construction, work trucks, tractors, trailers, maintenance vehicles and other safety equipment. Great to use while waiting for roadside assistance.The middle of the fluorescence triangle is diffuse, so it can make the driver in the day to see more clearly. Meets standard safety requirements for retroreflectivity and flourescence. 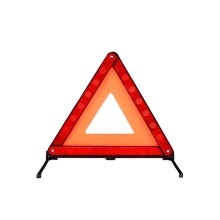 The brilliant red reflector on both sides of the triangle is safe at night. Practical specially in rainy, snowy ,mud or wind season. A good helper when some emergency things happen in roadside. By reminding the driver in the back slowing down, it will well keep your and your passengers&apos; safety of life.